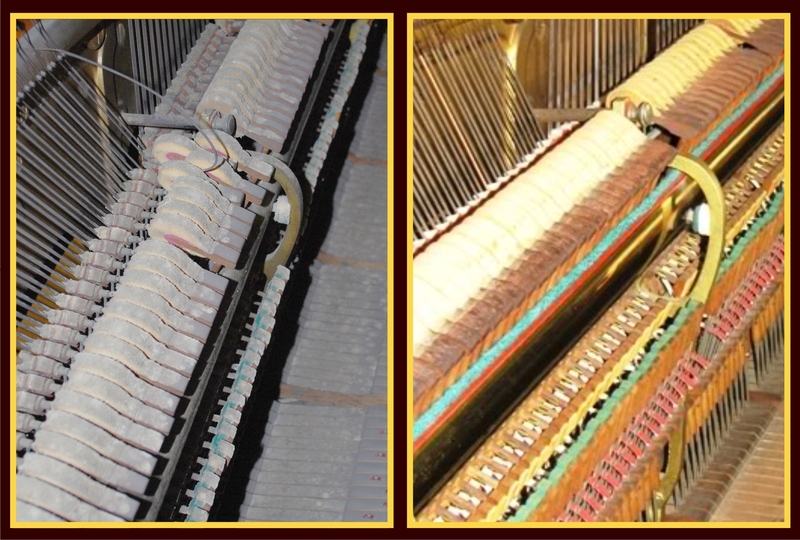 Below: Additional comparison photos of two 1905 Baldwin 53" vertical pianos showing the stark contrast between excellent and poor maintenance. Properly caring for your piano helps protect your investment and gives you the full, rich sound that you expect from your piano. These pictures clearly show the importance of performing regular service, selecting the right location and maintaining proper humidity levels in your home or at least inside your piano. The piano on the right has been properly maintained, both environmentally and mechanically. The piano on the left has been sitting in a damp basement for decades. Notice the extensive amount of mold and mildew that has accumulated on the hammers and other surfaces. It holds little to no value due to the extensive amount of work required to fix years of neglect. Seasonal humidity changes are the primary culprits that cause your piano to go out of tune. This occurs whether your piano gets played or not. The majority of your piano's parts are made of wood and are subject to the same shrinking and swelling as the wood inside your home. Keeping your piano at a constant relative humidity level will greatly increase it's life span and it's ability to hold a tune. Controling humidity is especially challenging here in central Illinois. The average temperature fluctuates between 86 degrees in July and 17 degrees in January. Seasonal heating and cooling cycles can cause dramatic swings in your home's relative humidity. The average daily relative humidity is consistently between 83% in the morning and 64% in the evening. Your piano's pitch closely follows your indoor humidity cycle and if it is not controlled your piano is in a constant state of change. This graph shows the seasonal average relative humidity for central Illinois. The blue dotted line shows the average relative humidity range for a piano with a properly maintained humidity control system. Install a climate-control system inside your piano. A piano climate-control system will continuously regulate the humidity level inside your piano. A system is easy to install and maintain. Best of all, it operates silently, out of sight and keeps your piano stabalized between tunings. Your piano should hold a tune much better and reduce the adjustments required on subsequent tunings and service calls. A climate-control system costs around $500 for a vertical piano and around $600 for a grand piano. The cost includes installation. It’s a cost-effective way to protect, maintain and care for your piano. Depreciation of the piano's value due to physical deterioration. I am an experienced "Piano Life Saver" system installer and welcome the opportunity to discuss the system's advantages with you. Call me for more information. Treat your piano the same as your other fine pieces of furniture. Dust and Finger Prints - Wipe with a soft, clean, lightly-damp cloth. 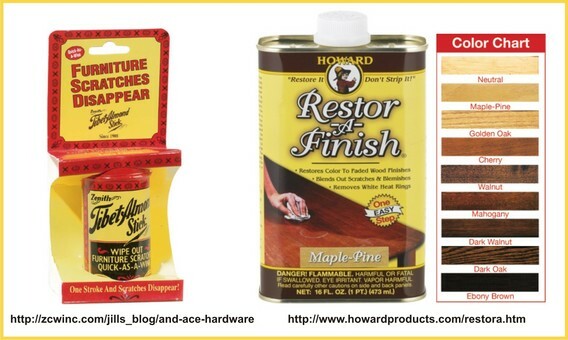 Scratches - I recommend using Tibet Almond Stick to hide light scratches and Howard's Restor-A-Finish to bring surfaces back to life. They work wonders on most finishes and they are quick and easy to use. The results are amazing. Ask for it at your local hardware or home improvement store or check them out online. Cleaning Keys - Treat them like dust and finger prints, just make sure to completely dry the keys after cleaning. Inside the Piano - Dust and other materials collect inside your piano and under the keys, but leave this type of cleaning to me. If the piano is excessively dirty to the point where it is affecting performance, I will discuss this with you and estimate a complete cleaning as an additional service.